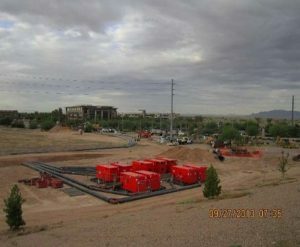 Description of Project: The project consisted of installing 15,700 LF 28” fusion welded HDPE force main within an existing utility corridor along the south side of the Santan 202 freeway. The project also included bypassing and completely retrofitting and upgrading an existing lift station; installation of a 66” by 24” “wye” junction structure into an existing 66” sanitary sewer line requiring a 30 million gallon per day sewer bypass; installation of a beam and plate shoring system to allow excavation to a depth of 35 feet to expose an existing casing adjacent to the Santan 202 freeway; and miscellaneous work: landscaping, seeding, asphalt, manholes, monorail, pump installations, VFD installation, electrical, prefabricated building installation, generator installation, manhole removal and replacement, 36” gravity sewer removal and replacement, 6” waterline relocation, vapex odor control system installation, grading, rock mulch, bypass work, manufactured CLSM, and O&M road construction. than original contract amount due to allowance items that were included in the original contract and not fully expended.